RJ Simon is a multidisciplinary artist and a published author/illustrator. She is a full member of the Society for Children’s Book Writers and Illustrators, the Australian Society of Authors, the Children's Book Council of Australia, Book Links, and the Just Write For Kids facebook group. The first story in her fictional series for middle graders, Ruby Lane, was published mid 2017. Where does RJ Simon Live? 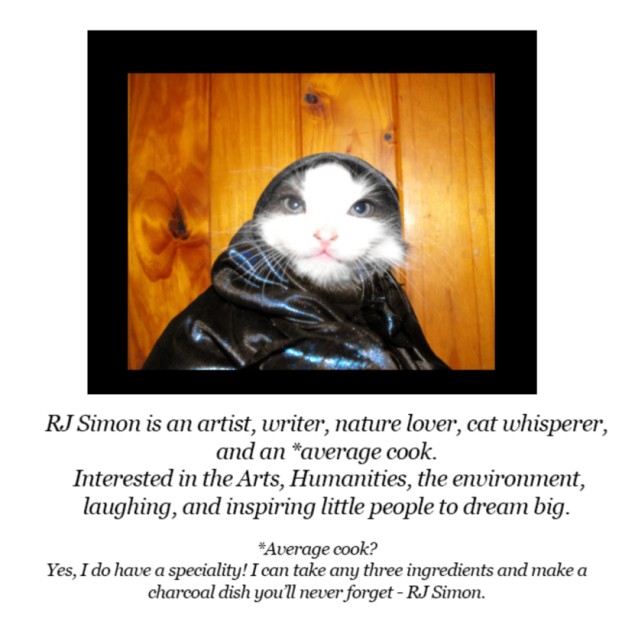 ​RJ lives in the Australian bush with her husband, their daughters, and lots of cats! There is also a wild wallaby with no respect for gardens, some cheeky parrots, goannas, echidnas, lots of spiders, and an emu with a taste for car keys. ​She enjoys inspiring people to unlock their own personal brand of creativity, to dream big, and to laugh heartily. A photo of Puss Puss the Wallaby. You can find out about RJ's latest children's books projects in the new updates section of this website or read RJ's personal blog or find/connect/follow/like on Facebook, Twitter, or Pinterest using the links below. Would you like to find out a little bit about the wild Australian animals and birds that visit RJ?